Raise a glass across the Valley (and throughout the Berkshires, too!) as the third annual Western Mass Beer Week rolls in this month. 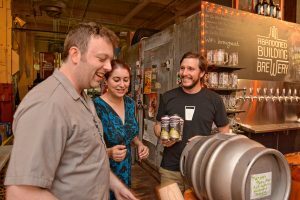 The eight-day celebration of local craft beer — which runs June 9 to 16 — is jam-packed with limited releases, special collaborations, beer dinners, cask tappings, and local products at breweries, bars, and restaurants across Franklin, Hampshire, Hampden, and Berkshire counties. Typically, we might say that the third time’s the charm. But Western Mass Beer Week was a hit from day one, and the field has only diversified since then. In 2016, by my count, 35 businesses participated. In 2017, more than 50 businesses got involved. This year, 60 breweries, restaurants, bars, package stories, and other businesses are showing off the locally-made stuff that makes us proud. It’s all bookended by the Berkshire Beer Fest in Pittsfield on June 9 and the Worthy Craft Beer Showcase in Springfield on June 16. Every night during Western Mass Beer Week, Taphouse Grille in West Springfield will offer a special menu of beer and food pairings from 4-9 p.m., with details announced daily on Facebook. Belly of the Beast in Northampton will carry Artifact Cider Project on tap and in cans all week, with a special visit on Thursday from the cidery’s co-founders, who will bring some limited-release bottles to sample. Bistro 63 in Amherst will pour $5 local drafts from noon to 9 p.m. daily. And in Millers Falls, Element Brewing & Distilling will pull some bottles from their “vintage library” — some dating all the way back to 2012 — for a special tasting each day. Berkshire Craft Beer Festival and Chug Run 5K: At the Common Park in Pittsfield from noon to 5 p.m. All proceeds benefit local charities. Featuring drinks from Amherst Brewing, Artifact Cider Project, Big Elm Brewing, Bright Ideas Brewing, Drunken Rabbit Brewing, Hitchcock Brewing, Lefty’s Brewing, New City Brewing, and Shire Breu-Hous. Tickets required. Pints in the Park: Second annual concert party at the Greenfield Energy Park from noon to 6 p.m. features food and beer, with live music from Home Body, Hevvi Synthia, Kalliope Jones, The Fantastic Partnerz, and Reverend Dan and the Dirty Catechism. Brews from The People’s Pint, Berkshire Brewing Company, Element Brewing Company, Lefty’s Brewing Company, Brick & Feather, Hitchcock Brewing Company, Artisan Beverage Cooperative, and Honest Weight Artisan Beer. Tickets required. Ludlow Brew Run: Four-mile run from 1-4 p.m. starts and ends at Iron Duke Brewing, where runners will get their first post-run beer for free. Registration required. Bacon and Beer Pairing: The Foundry in Northampton offers four local beers paired with a series of bacon samples glazed with different ingredients. 3-10 p.m.
Beer Release: Abandoned at Lefty’s: Easthampton’s Abandoned Building Brewery and Greenfield’s Lefty’s Brewing Company have joined forces on an imperial stout with notes of oak, coffee, chocolate, and vanilla. Sold on tap and in cans at Abandoned Building starting at noon. Valley Malt CT Riverboat Cruise: Hadley’s powerhouse malt growers host a two-hour tour up the Connecticut River on the Lady Bea Riverboat, featuring samples of beer and snacks made with local malts. 1-3 p.m.; tickets required. First Annual Belchertown 5K: Arcpoint Brewing Company raises money for the Pioneer Valley USO, with co-presenters Antonio’s Pizza and Baystate Dental. 10 a.m. to 4 p.m. Participants receive a shirt, bib, pint of beer, and a slice of pizza after the event. Registration required. Strawberry Festival: Outlook Farm Brewery in Westhampton offers beer and barbecue in the taproom from noon to 3 p.m., with music from the Standing Bear Band at 1 p.m.
Western Mass Beer Trivia: The Foundry and Beerology in Northampton team up for a very nerdy beer-focused trivia event (with prizes), held at the Foundry from 7-11 p.m. Limited seats; early sign-up recommended. $10 per person entry includes blind beer tasting. Smartest Brewery in Western Mass: Smartphone trivia night hosted by The Taproom in Hadley invites participants to join their favorite breweries’ teams and try to win this year’s Golden Tap award. 7-10 p.m.
Lager, Pilsner, Kolsch Night: Starting at 4 p.m., the Dirty Truth in Northampton taps beers in select styles from Amherst Brewing, Berkshire Brewing Company, Brick & Feather Brewery, Fort Hill Brewery, Honest Weight Artisan Beer, The People’s Pint, and Vanished Valley Brewing Company. Taps and Trivia: Plan B Burger Bar in Springfield hosts smartphone trivia. Special taps and attendees include Vanished Valley Brewing Company, Abandoned Building Brewery, New City Brewery, Brewmaster Jack, Artifact Cider Project, Berkshire Brewing Company, and Iron Duke Brewing. 8-11 p.m.
Beer Through the Ages: New City Brewery in Easthampton hosts a TED-style talk by Jordana Starr of Beerology about the complex and crazy history of beer. $5 cover; 8-10 p.m. Outdoor Deck Keg Tapping: Bistro 63 in Amherst taps beer from Building 8 Brewing on the outdoor covered deck from 5-7 p.m.
Short Film and Beer: Abandoned Building Brewery in Easthampton presents Roxy and the Renegades, a locally-produced short film shot in Western Mass. Screening at 6:30 p.m.; limited couch space. Foundry Firkin Faceoff: The Foundry in Northampton serves cask lagers from Amherst Brewing, Brick & Feather, Bright Ideas Brewing, Iron Duke Brewing, and The People’s Pint. 5-8 p.m.
Oysters and Oyster Beer: Amherst Coffee serves fresh oysters from Berkshire Seafood along with a new saison brewed with oysters by Bear and Bramble Brewing. 5-9 p.m.
Brewer’s Dinner: The Taproom in Hadley serves beer from local breweries including Bright Ideas Brewing and Brew Practitioners alongside a five-course meal by local chef Jason Dinelle. 7-10 p.m.
Locals Beer Dinner: Europa in Ludlow offers a six-course meal with beers from Vanished Valley Brewing Company, Amherst Brewing, Abandoned Building Brewery, Drunken Rabbit Brewing, Fort Hill Brewery, and a special collaboration between Vanished Valley and Greater Good Imperial Brewing Company. Advance tickets required. 6-9 p.m.
A Valley Malt Experience: Starting at 4 p.m., the Dirty Truth in Northampton pours local beers that showcase the variety and quality of the grains produced by Valley Malt, with accompanying food specials. Featured breweries include Abandoned Building Brewery, Bear and Bramble Brewery, and Honest Weight Artisan Beer. Third Annual Cask Night: Iron Duke Brewing in Ludlow taps a few special casks, with food available from 413Eats. Live music by Merrill Shepard. 3:30-9 p.m.
Jane Doe 16 Release: This collaboration between Drunken Rabbit Brewing, Jute Town Brewing, and Amherst Brewing is the newest in Amherst Brewing’s experimental hoppy series. They release this double IPA — conditioned on strawberry and pineapple puree — at 11:30 p.m. at the Hangar Pub and Grill in Amherst. The beer will be on tap at all Hangar locations (with limited cans available) and at Smith Billiards in Springfield. Drag Queen Trivia: Monthly event at Gateway City Arts in Holyoke, hosted by Jenayah De Rosario Della Notte, teams up with Artisan Beverage Coop in Greenfield for a special evening of trivia powered by Ginger Libation. 7-10 p.m.
Beer Pairing Dinner: Element Brewing and Distilling in Millers Falls hosts a four-course, fixed-price dinner paired with beer and a special aperitif made in-house. Advance tickets required. 5-8:30 p.m.
No Fun Sour IPA Beer Release: Bright Ideas Brewing’s limited-release New England-style sour is a collaboration with Hermit Thrush Brewery and Four Star Farms. Tasting at the North Adams taproom serves as a pre-concert party for The Decemberists, who play next door at MASS MoCA the same night. 1-8 p.m.
Jessica Release: Jessica is a variation on Amherst Brewing’s flagship IPA Jess, and is brewed exclusively for Beer Week. Released at 11:30 p.m. at the Hangar Pub and Grill in Amherst, and on tap at all Hangar locations (with limited cans available). The Worthy Craft Beer Showcase: Always a sell-out event, “the Worthy” features four hours of tastings of local beers. This year’s line-up includes Spencer Trappist Brewery, Berkshire Brewing Company, Jack’s Abby, Iron Duke Brewing, and many more. Advance tickets required; noon to 4 p.m. The Brewery Comedy Tour: The Taproom in Hadley presents a night of beer, wine, spirits, and stand-up. Tickets required; 7:30-9:30 p.m.
My Beershake Brings All MA Friends to Da Yard: The Foundry in Northampton presents a special menu of “beershakes,” including Orange Sorbet with IPA, chocolate ice cream with local stout, and more, in collaboration with Herrell’s in Northampton. Noon to 11 p.m.